Those hairy, milk-producing, warm-blooded animals that you have seen all of your life are mammals. Let's introduce our discussion of mammals with the quagga (left). The quagga is symbolic of the continuity between the living and the extinct  it was native to desert areas of the African continent until it was exterminated in the 1880s. Related to horses and zebras, it was a yellowish-brown with stripes only on its head, neck and forebody. 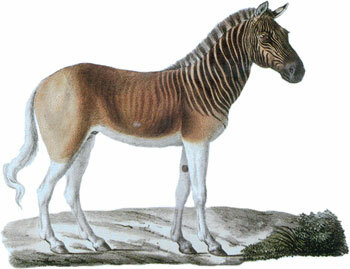 The quagga is (or was) a placental mammal, a group also called Eutheria by scientists. Placental mammals are one of three major groups of living mammals. Marsupials, or Metatheria, form another. This group includes all of the pouched animals, such as oppossums, kangaroos, and Tasmanian devils. The third group, the monotremes, are far less diverse and less well known. They are warm-blooded, have hair, and produce milk just like other mammals, but they lay eggs and do not give live birth like marsupials and placentals. A fourth major group, the Multituberculata, are entirely extinct, though they were once widespread and successful. To explore the world of mammals, click on the group of your choice in the image below. Mammals themselves are part of a larger tetrapod group called the Synapsida. Synapsids make up one of the two largest groups of amniote vertebrates. Note that not all synapsids were mammals. A non-mammalian member of Synapsida is Thrinaxodon. The Thrinaxodon exhibit is of special interest because it uses CAT-scan technology to view the internal structure of a Thrinaxodon skull. Read about the recent discovery of an early mammal fossil in Australia at the Dinosaur Dreaming site in Australia. View the Paleocene Mammals page for information about the archaic mammal species that lived between 65 and 55 million years ago.